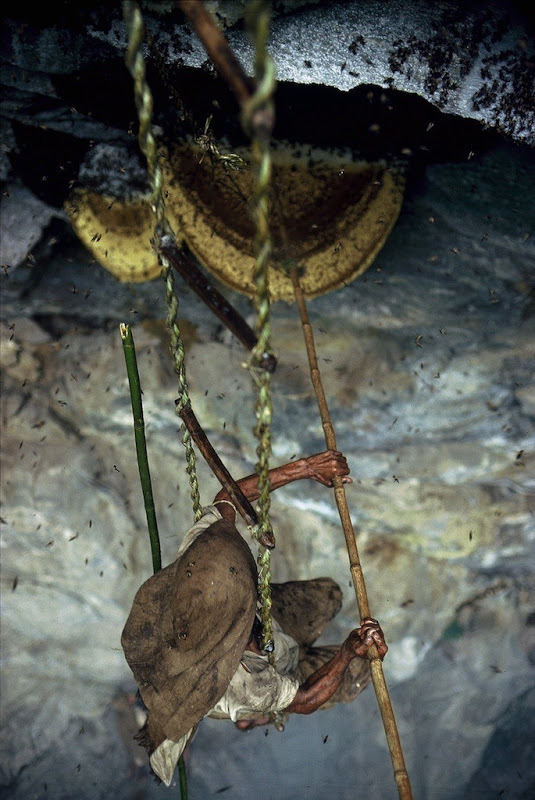 Gathering and using honey is one of the oldest known jobs with many ancient cultures and civilisations doing it. 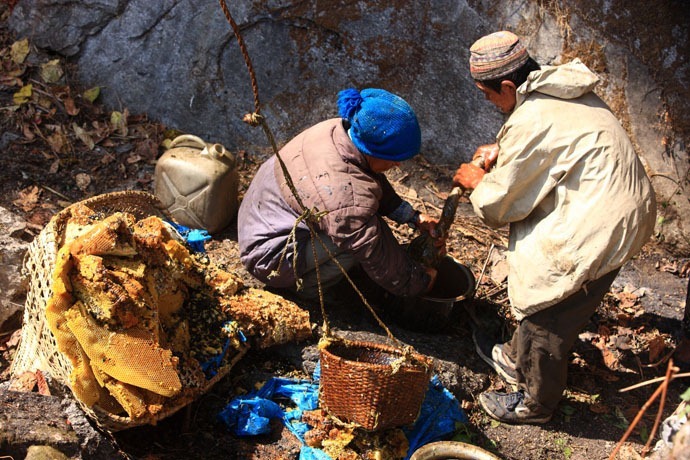 Honey is a delicious food but was also used in many other applications and researchers studying rock paintings believe that honey has been used since 13,000 BC. 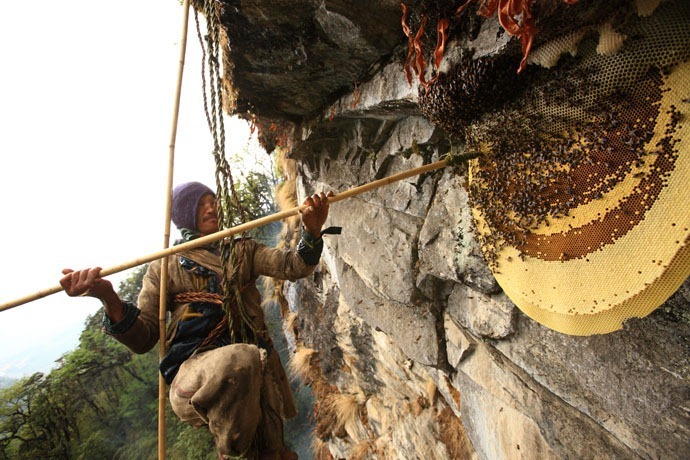 In the Himalayan country of Nepal, collecting honey has been practiced for thousands of years and is an integral part of their culture. 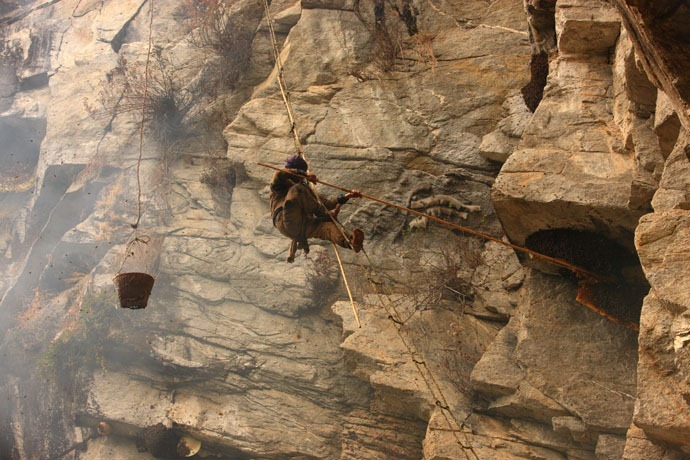 These bees construct their hives on cliff faces making collection of their honey a very dangerous job and watching the honey hunters at work is a scary sight itself. 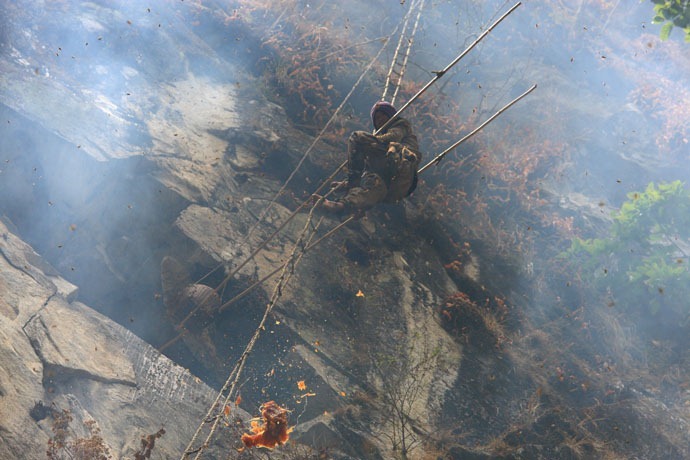 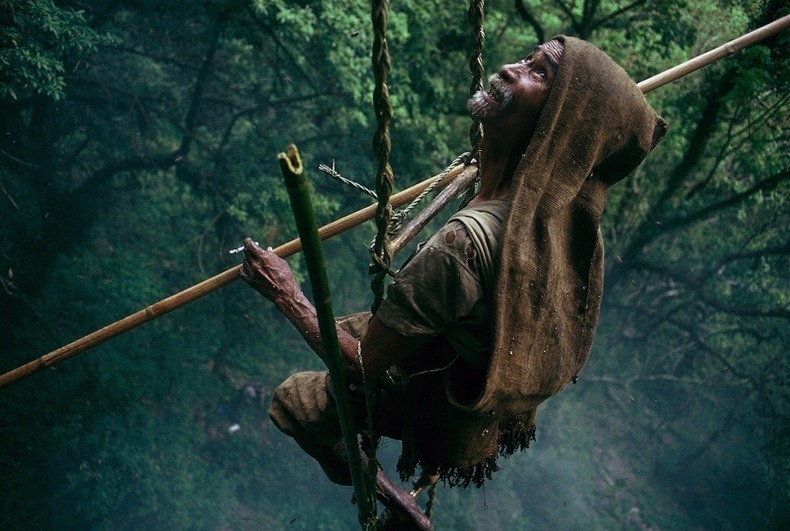 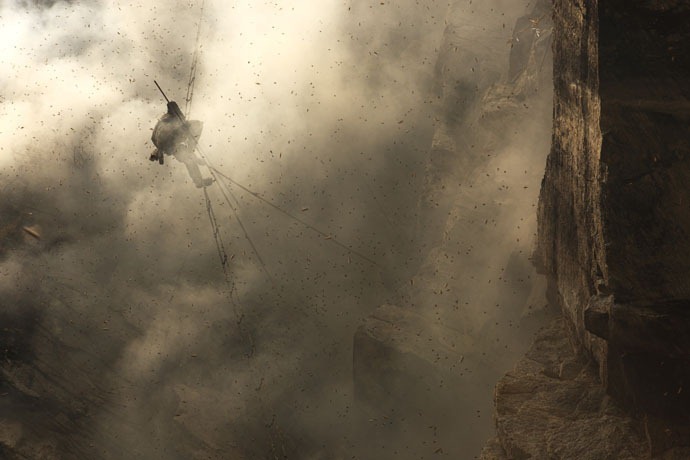 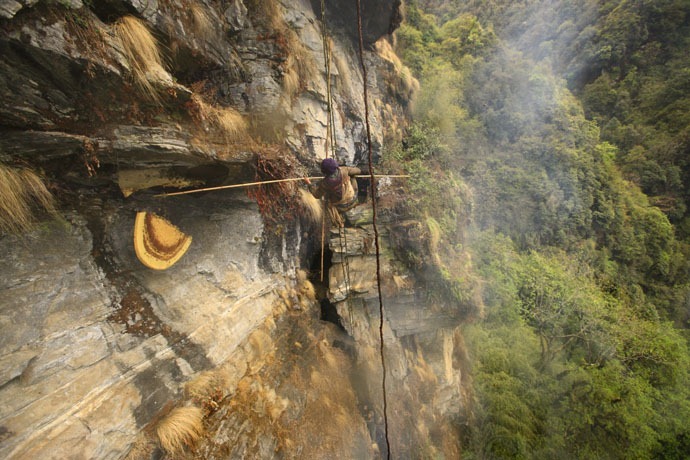 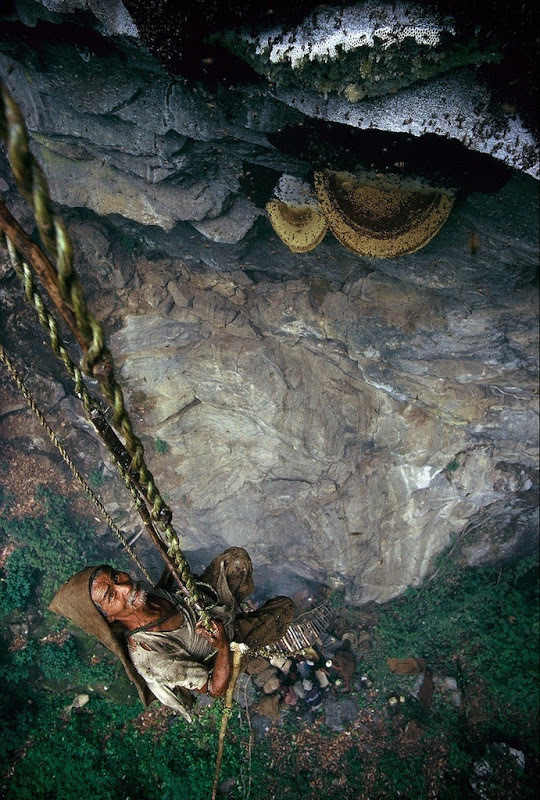 After flushing out the bees with smoke from a fire they start below the hive the honey hunters collect the combs of honey using baskets and rope ladders hanging precariously off the cliff face. 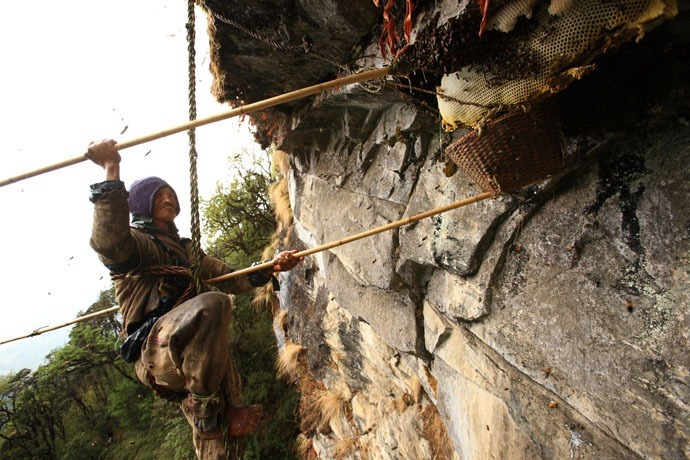 The harvesting of the honey generally takes place twice a year, hunters gather together in teams and head off into the Himalayan mountains to take on this dangerous task. 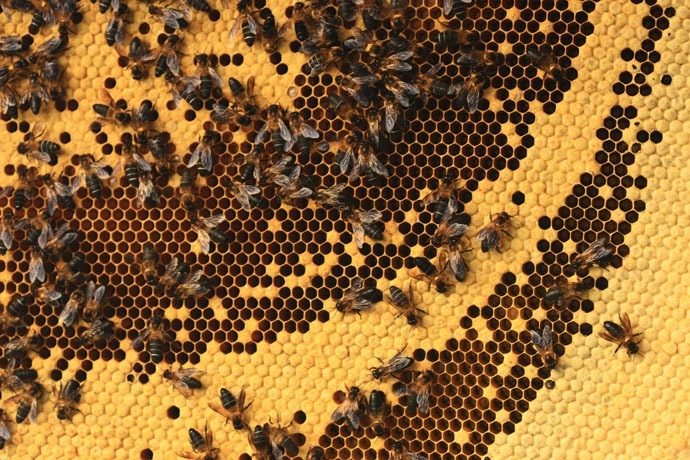 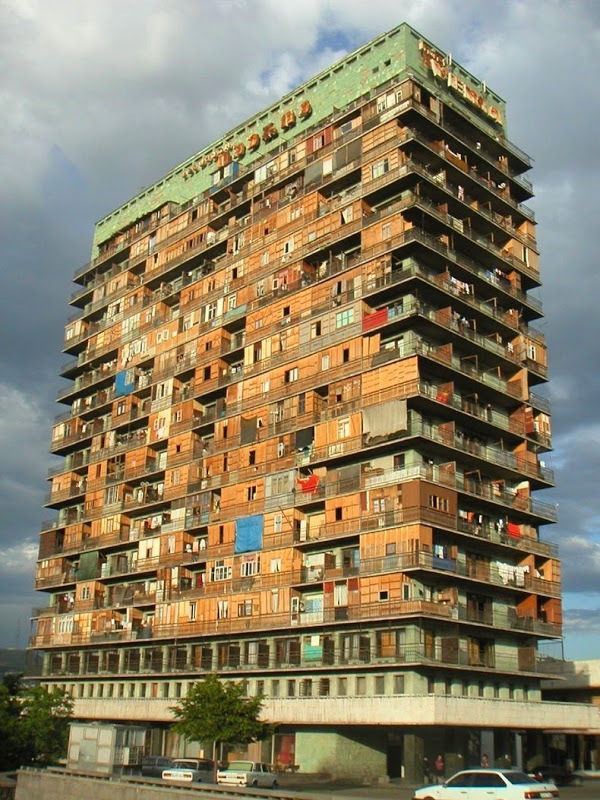 Harvesting just one colony could take up to three hours depending on the size of the hive and its location. 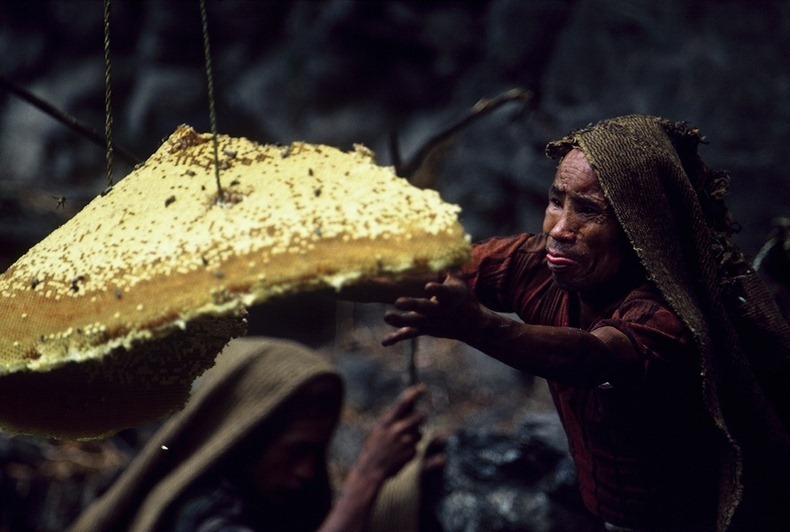 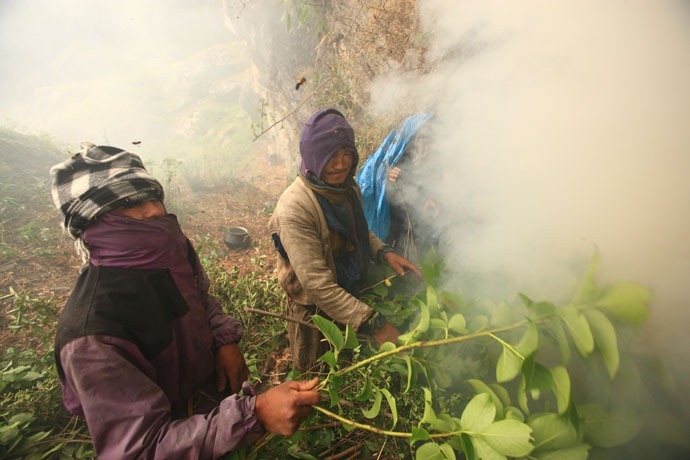 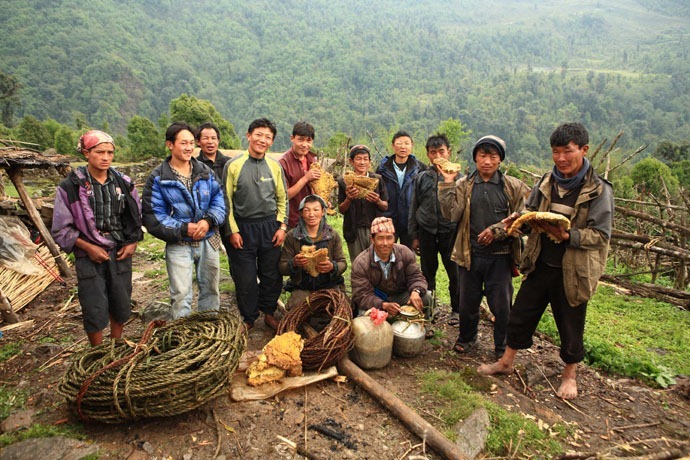 The harvesting of the honey has a ritual which varies slightly from community to community. 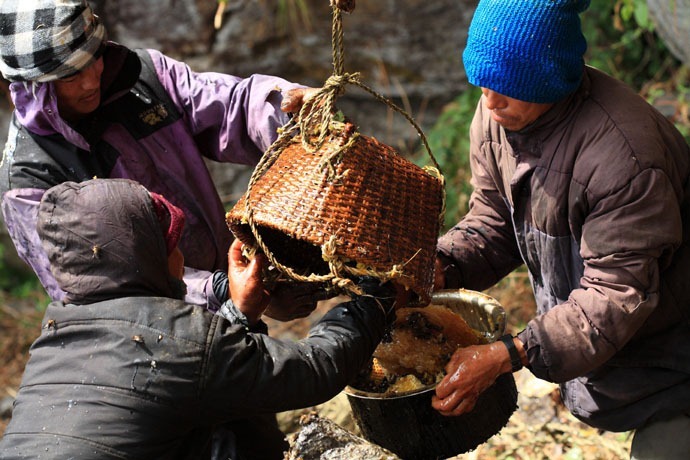 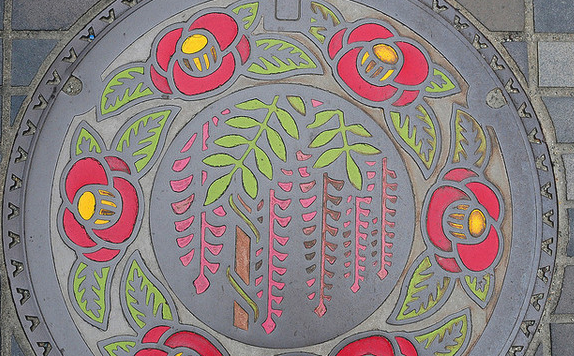 The harvest ritual starts with a prayer and a sacrifice of fruits, flowers and rice. 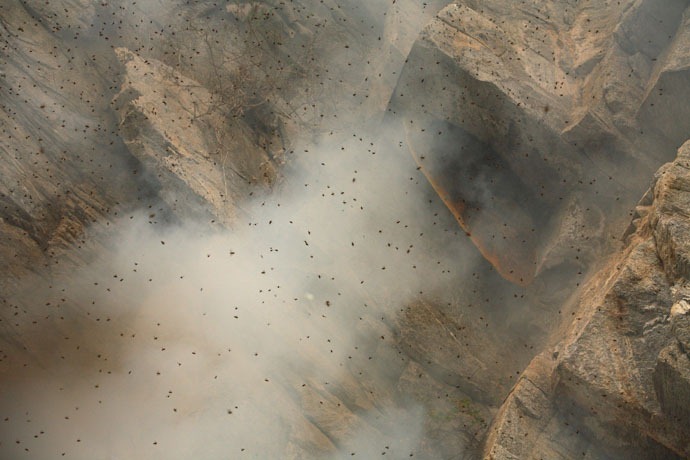 A fire is then lit at the base of the cliff to smoke the bees out of their honeycombs and make them more docile. 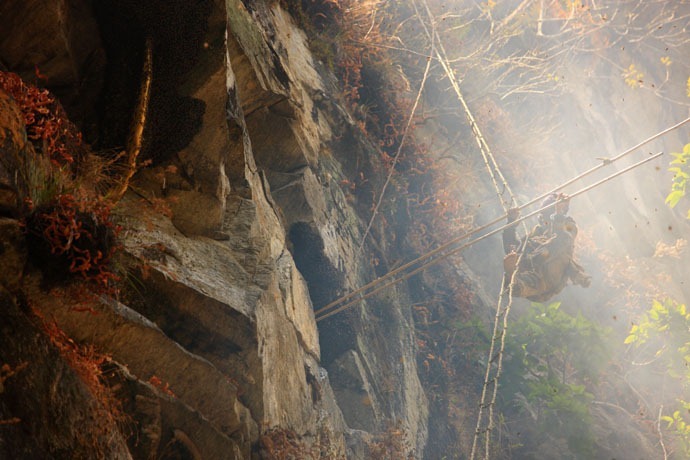 A hunter then descends the cliff attached to a rope ladder by ropes while his team secures the rope ladder and ropes to the cliff top. 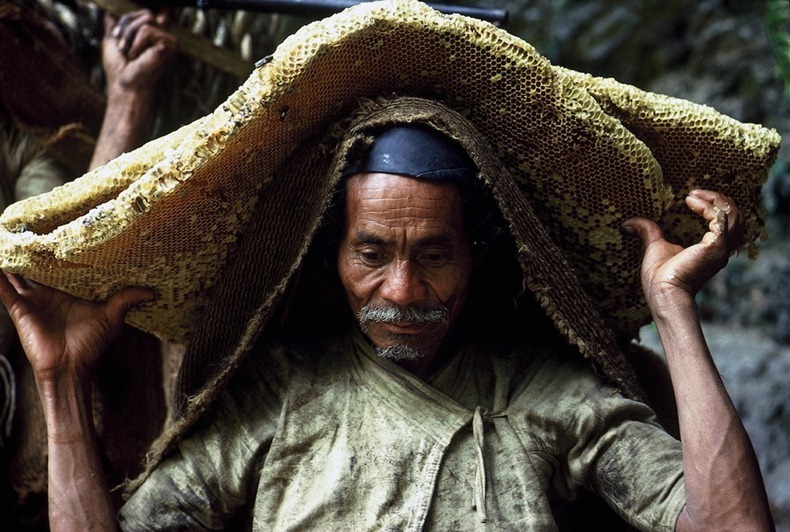 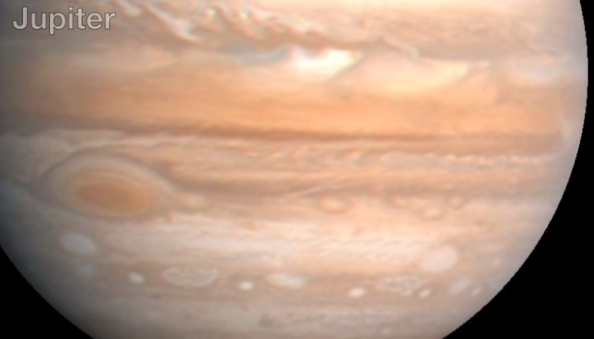 They pass down tools when needed and pull up the basket and tools when the hunter has managed to fight off the territorial bees and removed chunks of the honey from the comb. 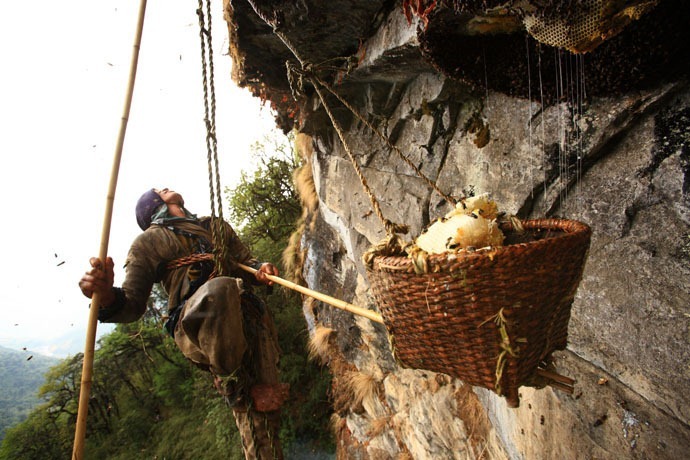 Believe it or not, but there are several tourist companies offering tours taking visitors to see the honey hunting teams at work hanging from the cliffs earning a living. 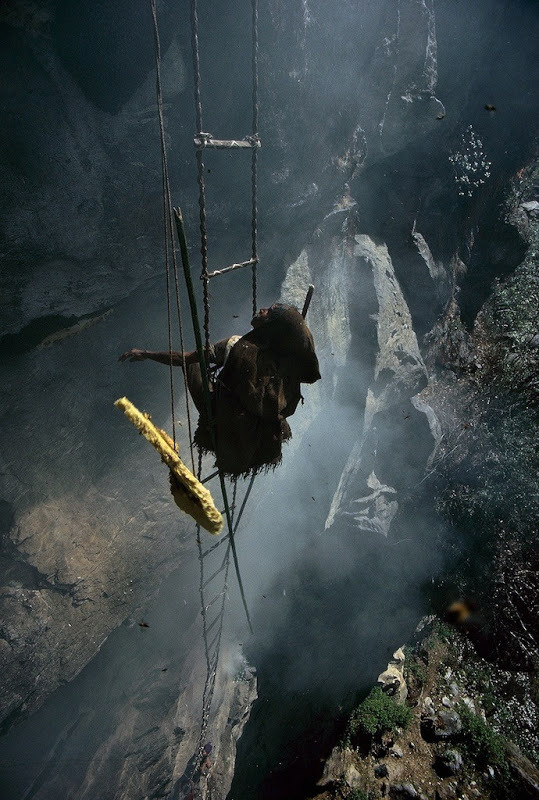 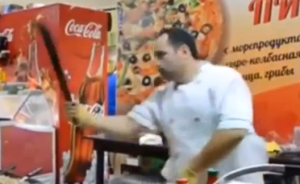 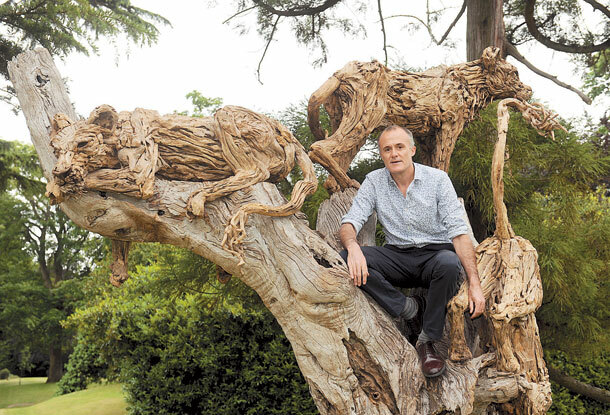 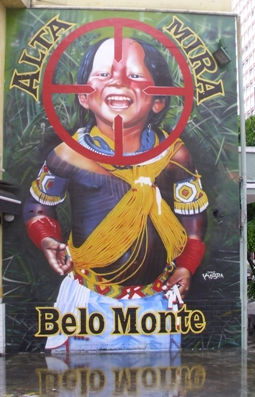 Tourists will be amazed at how fast and courageous the hunters are and marvel at the techniques they use today which have not changed for thousands of years. 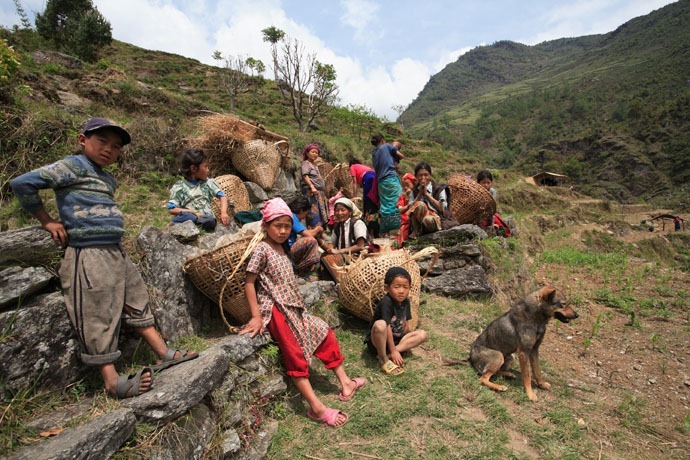 The trekking routes take the visitors through breath-taking scenery and to various locations where they can see the whole harvest event taking place. 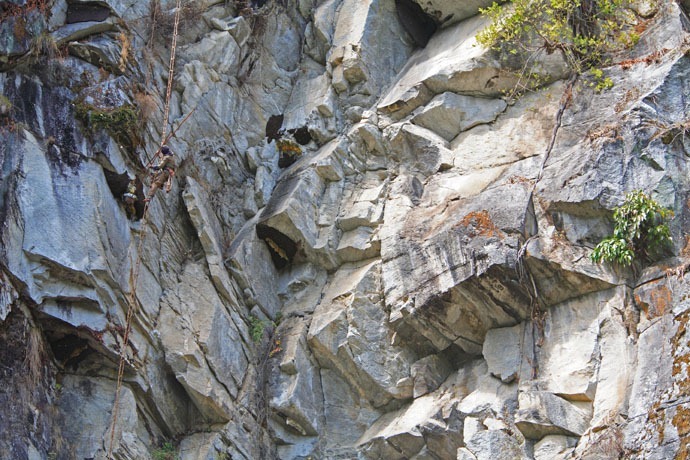 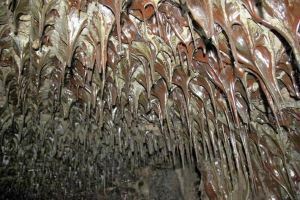 The visitors can take in the magnificent beauty of the Nepalese landscape and wildlife. 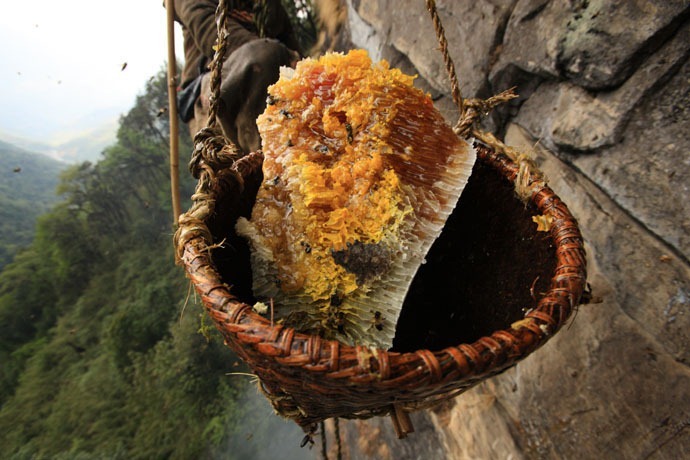 The most popular honey hunting areas are located in Bhujung, Nai Chi, Pasgaon, Naya Gaun, Ludhi and Dare. 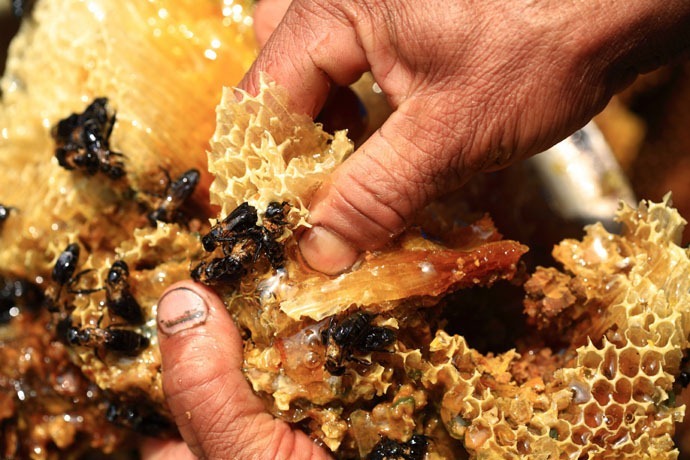 This honey is also known as ‘mad honey’ because it is mildly psychoactive and is used as a drug. 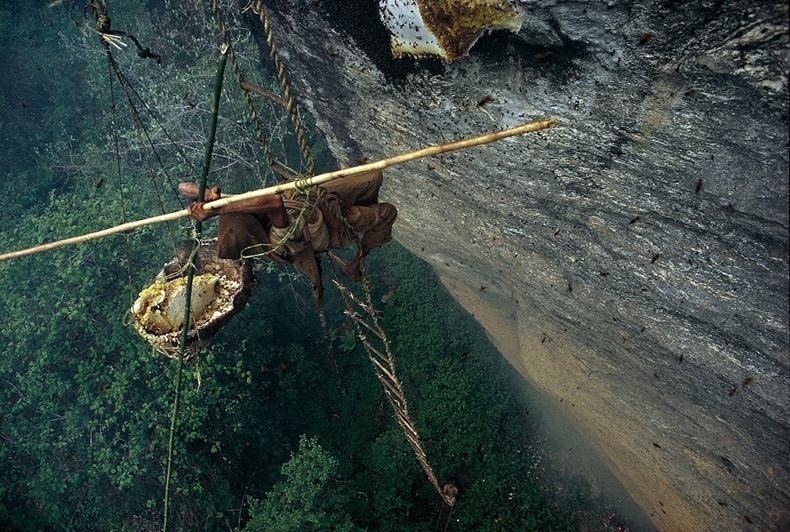 Those guys are crazy but they rely on the honey harvested to earn a living so that they can live and eat. 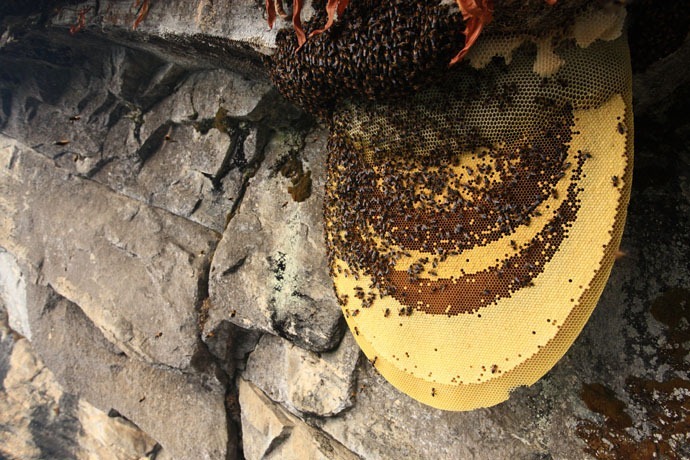 Hopefully the tourists bring in more money for them so with that in mind let’s help send them more tourist, the more people know about them the more will visit so please share this post using the buttons below and help them become more known.